People really love In-N-Out. People really love beer. The desire to combine the two is understandable -- commendable even. But if there's one thing companies really don't love, it's the use of intellectual property without permission. 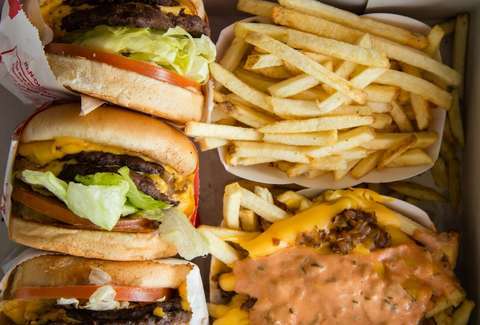 Because of this, the holy union of In-N-Out and beer will have to be deferred. That bold brewer attempting this was San Francisco's Seven Stills, which regularly releases out limited-edition beers. For instance, Seven Stills was planning to release a Neapolitan milkshake stout with the punny title "In-N-Stout." Which, fun! The brewery posted an Instagram of a can with the burger joint's famous red-and-white color scheme plus palm trees that would look right at home with the rest of In-N-Out's menu. But In-N-Out's legal department took notice before long. And while cease-and-desist letters are famously unchill, the tone of this one was super-friendly and included at least nine puns, in the spirit of the brew it was addressing. "Please understand that use of our marks by third parties ales us to the extent that this could cause confusion in the marketplace or prevent us from protecting our marks in the future," the letters says. "We hope you appreciate, however, that we are attempting to clearly distill our rights by crafting an amicable approach with you, rather than barrel through this." We count 9. Can you find them all? Obert told SF Gate that Seven Stills was actually expecting the letter (though presumably the puns were unexpected), and that the cease and desist would be honored. The beer will get its release Thursday with a different label. To be clear, none of this forbids you from drinking the beer while you eat In-N-Out.